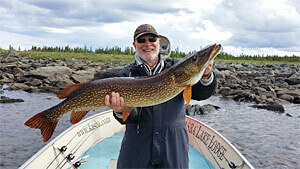 Kasba Lake has three distinct variations within the sport fishing season. Triple Trophy fish are caught during the entire summer, but each variation offers an edge to different types of fishing - pick the varia-tion that best matches the type of sport fishing that you want to do. Early Season, June 24th - July 16th. During the early season, shallow water Northern Pike fishing is at its best. Northern Pike spawn in shallow warm bays just after ice-off. What this means is that until the waters warm considerably Pike are congre-gated in shallow bays and are easy targets. During this time Lake Trout cruise the shallows and grayling come alive in the lake and rivers. If your primary sport fishing objective is huge Trophy Pike or shallow water Trophy Lake Trout, an Early Season trip is definitely for you. If you're looking for the Triple Trophy and the best overall sport fishing for all of Kasba's game fish, Mid Season is the choice for you. Long warm days and all three species hungry and accessible. This is also the time to target Arctic Grayling on the dry fly - a must do for any avid fly fisherman. 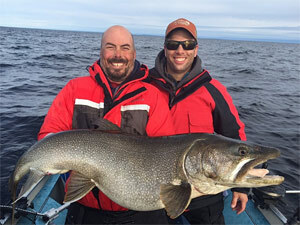 Cooler days signal Kasba's giant Trophy Lake Trout to move onto key reefs to spawn. From all over Kasba Lake, these big, beautiful fish pair up and migrate to the Dome to ensure the survival of their su-perior genes. Fishing for Trophy Lake Trout is as good as it gets, anywhere, during Late Season on Kas-ba Lake. 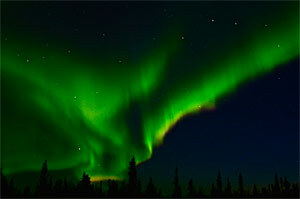 A special bonus of a late season sport fishing trip is that spectacular Northern Lights (or Aurora Borealis) can be seen during August at Kasba Lake!